The number 1 website in the world dedicated to golf in Italy! At the Golf Club Le Colline Acqui Terme you can start to play Golf. 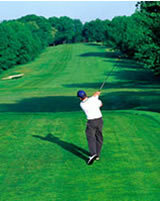 There is a regularly certified golf practice field, suitable for both professionals and novices players. The field is part of the I.G.F. and allows users to attend all golf fields in the world without further enrolments. Competitive enrolment prices. There is a federal instructor available for individual and group courses. The player will be followed by the instructor until he reaches his desired "handicap". From Milan: motorway A7, exit AL SUD. From Turin: motorway A21, exit AL SUD or FELIZZANO. From Genoa: motorway A26, exit OVADA. When you reach Acqui Terme, follow the road signs to the new Hospital: the Golf Club is in front of the Hospital. Copyright 2006-2009 © by O'Donnell & Associates S.r.l..